LOVE & CURIOSITY – THE COSMOS is a bold new work by textual scholar and cultural historian Danis Rose and theoretical physicist John O’Hanlon. For anyone concerned with the present state of the world, socially, politically, and environmentally, for those confounded by how to make breakthroughs in science accessible and humanly meaningful, and for those perplexed by the schism between the sciences and the humanities, this book will come as a revelation. This short, exacting work presents a radically new understanding of time, free will, reason, and reality: concepts at the very core of science, philosophy, religion and art. This short and brilliant book revises the history of life as we have been led to know it; it redeems natural human intuition; it restores meaning and purpose to the cosmos; and it opens the door to a new Enlightenment. In highly readable, concise and often poetic language, the authors succinctly identify the fundamental problems that bedevilled the ancients and still frustrate today’s leading thinkers; then, one by one, they show us how these questions are not as intractable as they once seemed. Love & Curiosity calls on each one of us, including scientists, philosophers, artists and theologians, to change our attitude toward the world and what constitutes reality, yet without the need to jettison our era’s discoveries in mathematics, physics, biology, and the greater humanities. The rewards of this engagement will be profound: a more accurate knowledge of who we are and where we came from (one we will grasp intuitively) and a clearer perspective from which we may envision where we are going and, indeed, judge where we should wish to go. Love & Curiosity revises the history of life as we have been led to know it; it redeems natural human intuition; it restores meaning and purpose to the cosmos; and it urges on a new era of Enlightenment. DANIS ROSE is a textual scholar and editor of modernist literature. He has written and edited many books, including the critical edition of James Joyce’s Finnegans Wake (Houyhnhnm Press, 2010; Penguin Classics, forthcoming April 2012), the Reader’s Edition of Ulysses (Picador, 1997), The Textual Diaries (Lilliput, 1995), The Lost Notebook (Split Pea Press, 1989) and volumes 28-63 of the James Joyce Archive (Garland, 1977-78). He has also made a study of the history of civilisations, both Western and Eastern. JOHN O’HANLON is a physicist (PhD, University of British Columbia) specialising in relativity and quantum mechanics. He is also a textual scholar and has worked with Danis Rose on many of his editorial projects. His main interest at present is in exploring the relationship between knowledge (and especially scientific knowledge) and the real world. The cleverness, clarity, and sweep of the presentation took my breath away. This book says so much, economically, vividly, and often with a lightness of touch that is charming. The genre is the telling of a grand narrative about embodied consciousness in the Cosmos, as told by the sciences from cosmology to quantum theory and in the light of the humanities, that is, of human history and culture. The story defends the moral beauty and religious wisdom of a modern scientific humanity against the meanness and trivialities of the materialist culture that is ascendant today in the West. I am a physicist, theologian, and a professor of the philosophy of science; I have studied physics and its philosophical umbra with Erwin Schrödinger, Eugene Wigner, and Werner Heisenberg; I find myself then in strong agreement with the authors of this book. I find it far wiser in its humanistic appreciation, deeper in its understanding of human life, more interesting in its scientific dimension, closer to the historical religious roots of human experience, and better written than any of the other books in its genre, even those that I have admired and enjoyed. While unwinding the mysteries of mathematics, physics and other sciences, the authors never lose touch with the real world of family life, the natural environment, and the human yearning to transcend history. —Patrick A. Heelan, William A Gaston Professor of Philosophy, Georgetown University, DC. 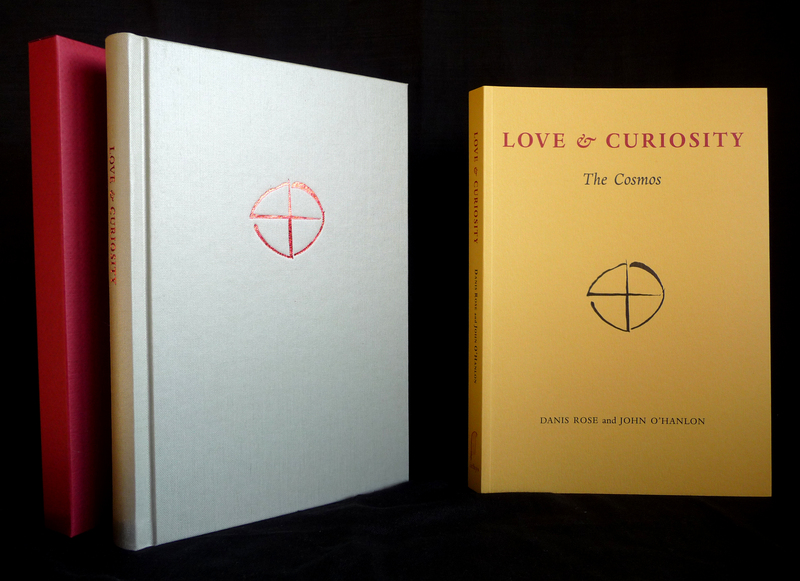 THIS FIRST EDITION OF LOVE & CURIOSITY BY DANIS ROSE AND JOHN O’HANLON WAS SET IN DANTE AND PRINTED BY MARTINO MARDERSTEIG AT STAMPERIA VALDONEGA, VERONA FOR ITHYS PRESS, DUBLIN. THIS EDITION IS LIMITED TO ONE THOUSAND COPIES. OF 100 COPIES PRINTED ON OLD MILL AND HARDBOUND 26 COPIES ARE SIGNED AND LETTERED A TO Z, 50 COPIES ARE SIGNED AND NUMBERED 1 TO 50, AND 24 COPIES ARE HORS COMMERCE. ALL OTHERS ARE PRINTED ON ARCOPRINT EDIZIONI AND PAPERBOUND. Lettered: €200, Numbered €100, Standard paperback €40.